The <serverSideInclude> element specifies whether server-side includes (SSI) #exec directives are disabled for Internet Information Services (IIS) 7. 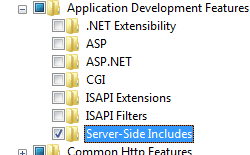 Specifically, the <serverSideInclude> element contains a single attribute: ssiExecDisable. 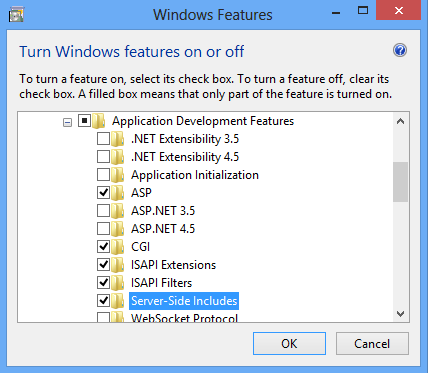 Setting the ssiExecDisable attribute to true will disable the SSI #exec directive for IIS 7, thereby preventing SSI files from executing programs, scripts, or shell commands on the server. 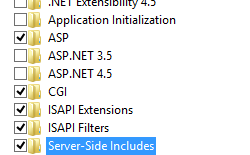 IIS 10.0 The <serverSideInclude> element was not modified in IIS 10.0. IIS 8.5 The <serverSideInclude> element was not modified in IIS 8.5. IIS 8.0 The <serverSideInclude> element was not modified in IIS 8.0. 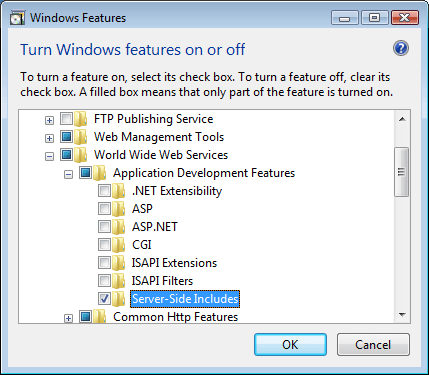 IIS 7.5 The <serverSideInclude> element was not modified in IIS 7.5. IIS 7.0 The <serverSideInclude> element was introduced in IIS 7.0. IIS 6.0 The <serverSideInclude> element replaces the IIS 6.0 SSIExecDisable metabase property. 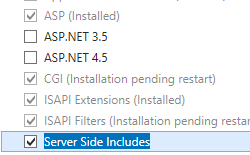 The <serverSideInclude> element is not available on the default installation of IIS 7 and later. To install it, use the following steps. 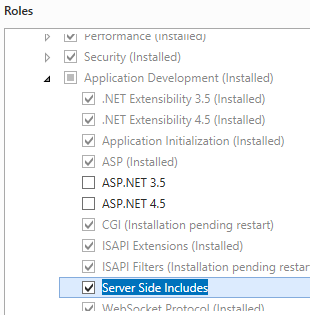 On the Server Roles page, expand Web Server (IIS), expand Web Server, expand Application Development, and then select Server Side Includes. Click Next. Expand Internet Information Services, expand World Wide Web Services, expand Application Development Features, and then select Server-Side Includes. 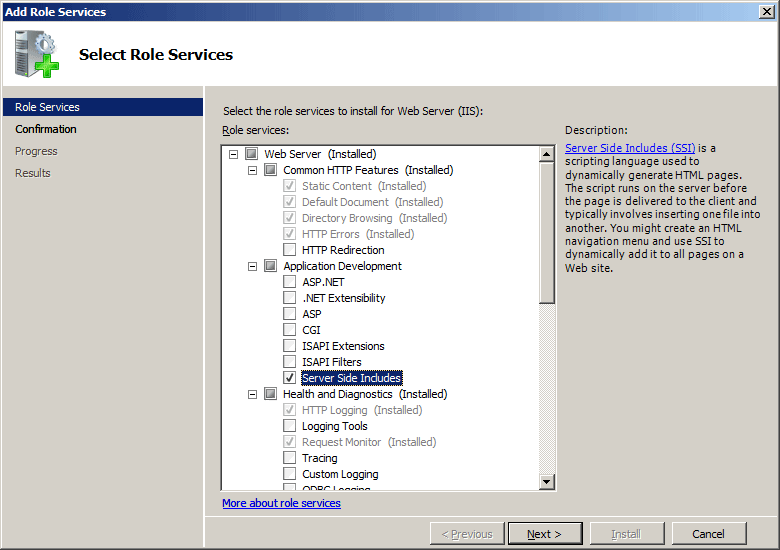 On the Select Role Services page of the Add Role Services Wizard, select Server Side Includes, and then click Next. Expand Internet Information Services, then select Server Side Includes, and then click OK. 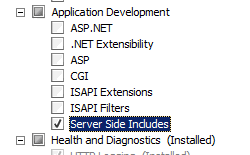 There is no user interface for configuring the <serverSideInclude> element for IIS 7. For examples of how to configure the <serverSideInclude> element programmatically, see the Code Samples section of this document. Specifies whether the SSI #exec directive is enabled (false) or disabled (true). When disabled, the directive cannot execute a program, script, or shell command on the server. The following configuration sample disables the #exec command for SSI files in the Default Web Site. The following code samples disable the #exec command for SSI files in the Default Web Site.